A New York City police officer was wounded Saturday while exchanging gunfire with a suspect involved in a brawl, authorities said. Officer Sherrod Stuart, 25, was shot in the ankle early Saturday morning, the day of his fourth anniversary with the department, New York City Police Commissioner William Bratton said. Stuart was among officers responding to a fight following a large party in Mott Haven in the Bronx at around 2 a.m., Bratton said. Police received a report of a street brawl involving guns, bats and knives on Third Avenue near East 137th Street. When officers arrived at the scene, they chased a man; Stuart was shot in the right foot, and he shot the suspect four times, Bratton said. The suspect, 19-year-old Christopher Rice, was in custody at the hospital and remained in serious condition, Bratton said. Rice, who has five prior arrests, had been released from custody only three hours before the shooting after being charged with fare-beating. 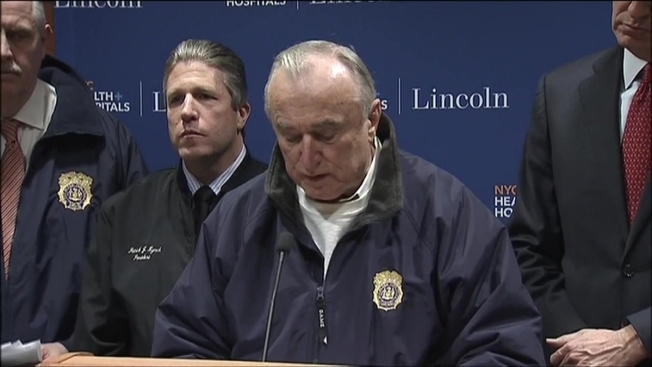 Mayor Bill de Blasio praised Stuart for his heroism. "In this situation, he distinguished himself further with his quick thinking, his brave actions," the mayor said, "and thank God his injuries are not life-threatening." The NYPD released a photograph of the injured officer giving a thumbs up from his hospital bed. The department also noted that Stuart's father is an NYPD detective.